This image titled “Wood Pile (SEM)” received Honorable Mention in Class 10 of the 2010 International Metallographic Contest. 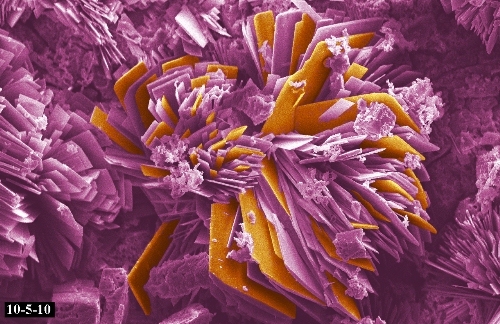 It was submitted by NT Saenz, JE Coleman, & Todd Schaef of PNNL. 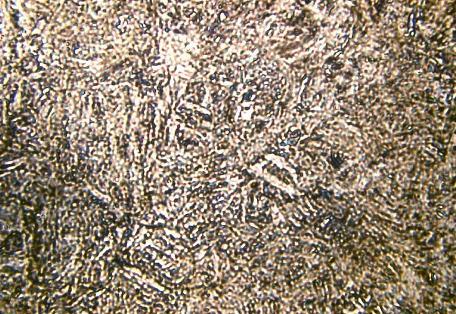 Metallography is the study of a materials microstructure. Analysis of a material’s metallographic microstructure aids in determining if the material has been processed correctly and is therefore a critical step for determining product reliability and/or for determining why a material failed. The basic steps for proper metallographic specimen preparation include: documentation, sectioning, mounting, rough grinding, fine grinding, polishing, etching and examination. 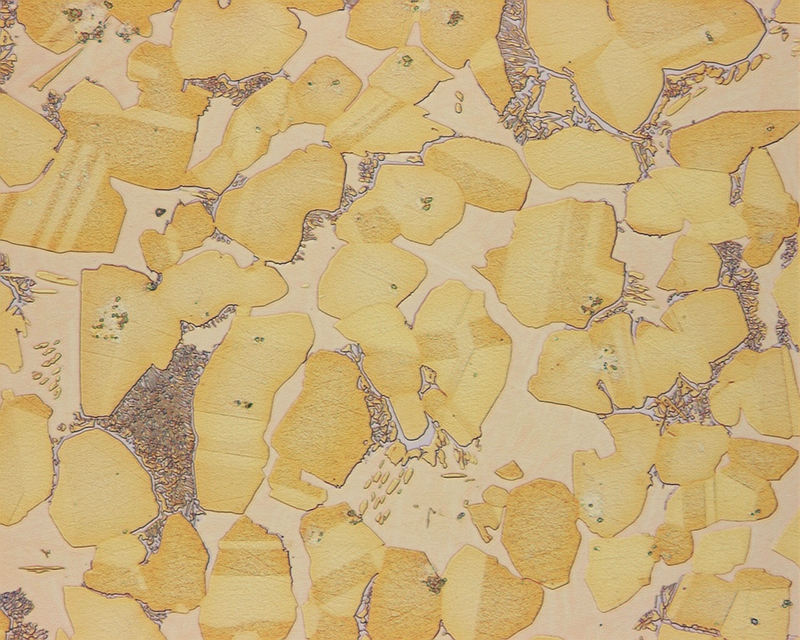 Metal surfaces and fractures examined with the unaided eye or with a magnifying glass or metallurgical or binocular microscope at magnifications less than 10 diameters can reveal valuable information as to the crystalline, chemical, and mechanical heterogeneity. Crystalline heterogeneity is known metallographically as grain. Chemical heterogeneity arises from impurities, segregation of chemical elements, and nonmetallic inclusions. 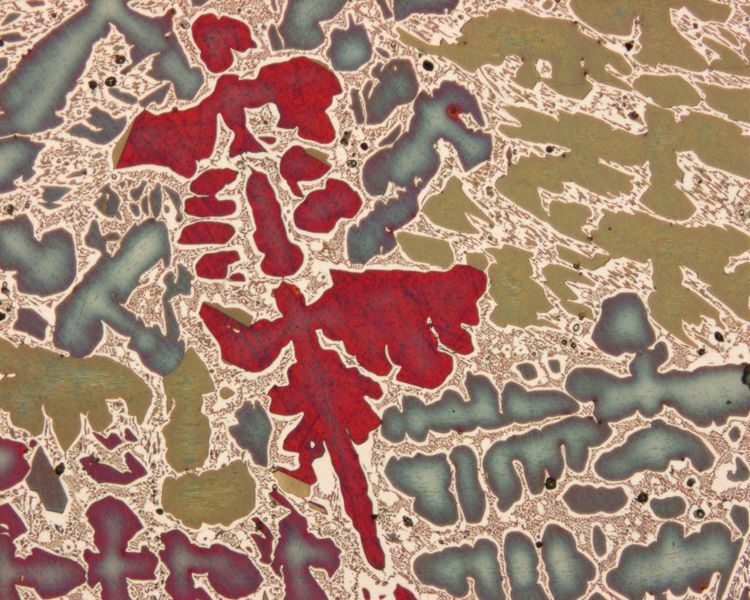 Mechanical heterogeneity consists of local deformations of structure, elongation or distortion of nonmetallic inclusions, and regions of chemical segregation, resulting from cold fabrication processes. Microscopic examination of polished or etched surfaces at magnifications ranging from about 100 to 1,500 diameters can reveal such information as size and shape of grains, distribution of structural phases and nonmetallic inclusions, microsegregation, and other structural conditions. Metallographic etching—that is, subjecting the polished surface to the action of a corrosive reagent—can reveal the structure by a selective and controlled solution or can unbuild the metal inwardly from the surface. This successive destruction occurs because of the different rates of dissolution of the structural components under the attack of the etching agent. Polarized light is useful to reveal grain structure, detect preferred orientation, examine oxide surface films, and identify phases of different composition. 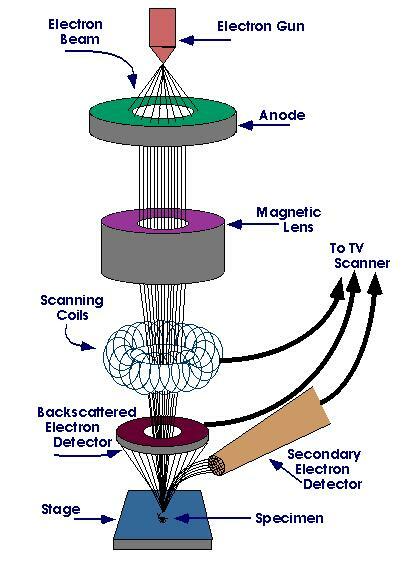 In electron microscopes a beam of electrons instead of a beam of light is directed onto the specimen because only a highly energetic electron beam will pass through metal films thicker than about 0.05 micron (1 micron equals 0.001 millimetre), a microscope specimen replica of the surface is ordinarily made. To do this a plastic solution is poured over the etched surface the hardened solution contains on one side a reverse impression of the surface contours of the specimen. The development of transmission electron microscopes, in which the electrons are accelerated to 100 kiloelectron volts or more, has made it possible to examine internal details of thin foils of metals. The surface of a metallographic specimen is prepared by various methods of grinding, polishing, and etching. 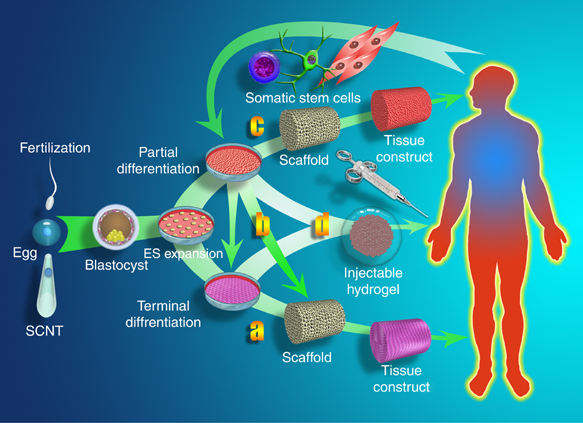 After preparation, it is often analyzed using optical or electron microscopy. 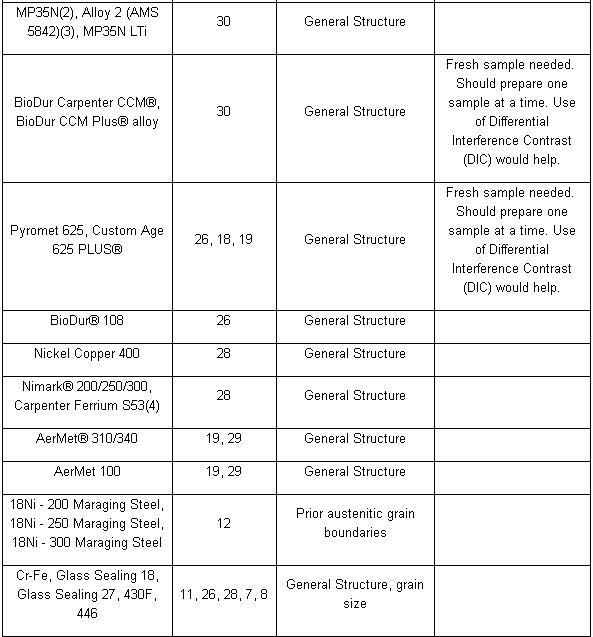 Using only metallographic techniques, a skilled technician can identify alloys and predict material properties. 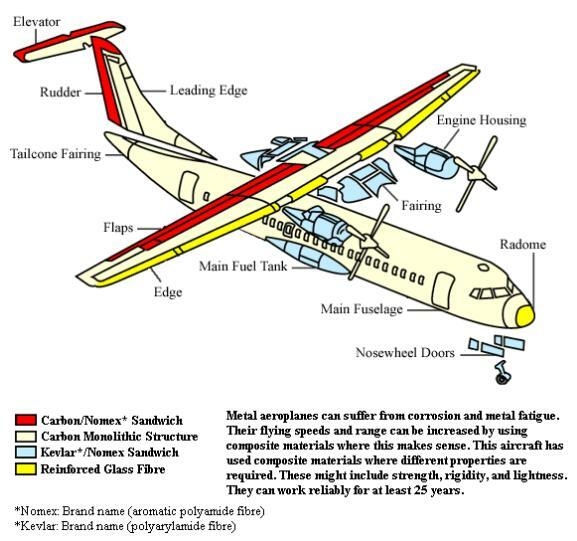 Mechanical preparation is the most common preparation method. 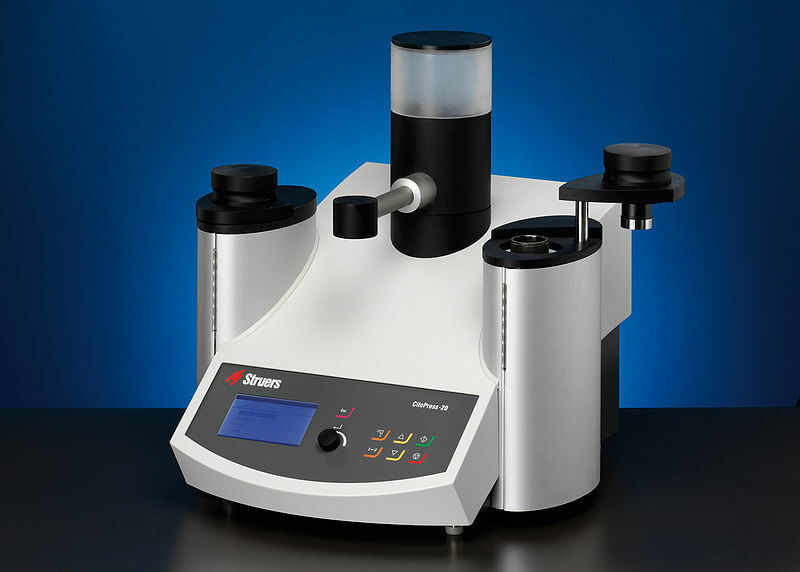 In a series of steps, successively finer abrasive particles are used to remove material from the sample surface until the desired surface quality is achieved. Many different machines are available for doing this grinding and polishing, able to meet different demands for quality, capacity, and reproducibility. Hot mounting press equipment, the specimens are placed in the mounting press. A systematic preparation method is the easiest way to achieve the true structure. 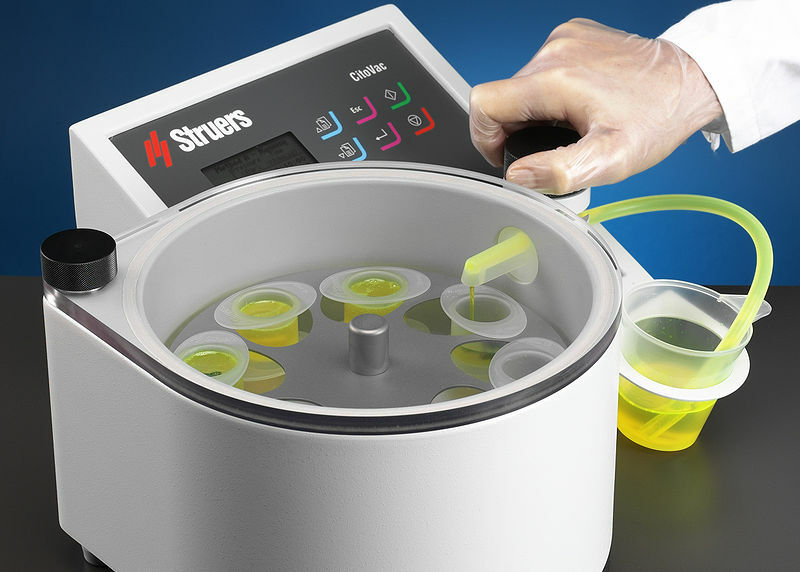 Sample preparation must therefore pursue rules which are suitable for most materials. Different materials with similar properties (hardness and ductility) will respond alike and thus require the same consumables during preparation. Metallographic specimens are typically “mounted” using a hot compression thermosetting resin. In the past, phenolic thermosetting resins have been used, but modern epoxy is becoming more popular because reduced shrinkage during curing results in a better mount with superior edge retention. A typical mounting cycle will compress the specimen and mounting media to 4,000 psi (28 MPa) and heat to a temperature of 350 °F (177 °C). When specimens are very sensitive to temperature, “cold mounts” may be made with a two-part epoxy resin. Mounting a specimen provides a safe, standardized, and ergonomic way by which to hold a sample during the grinding and polishing operations. Cold mounting equipment. The specimens are placed in a mounting cup and mounting material is then poured over the specimens. After mounting, the specimen is wet ground to reveal the surface of the metal. The specimen is successively ground with finer and finer abrasive media. Silicon carbide abrasive paper was the first method of grinding and is still used today. 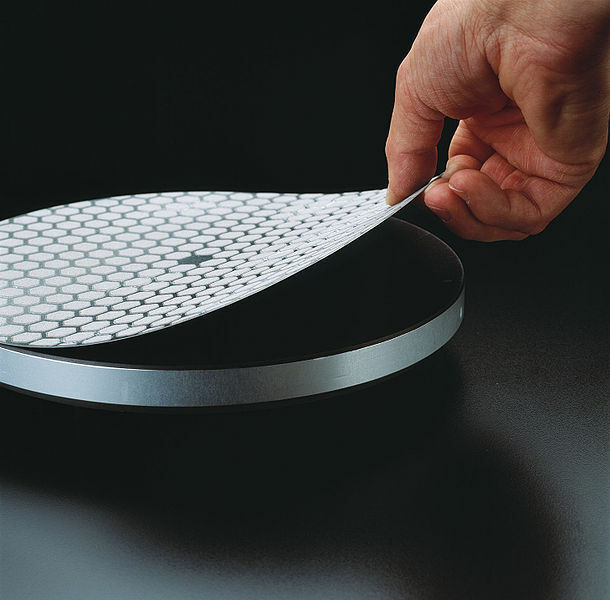 Many metallographers, however, prefer to use a diamond grit suspension which is dosed onto a reusable fabric pad throughout the polishing process. Diamond grit in suspension might start at 9 micrometres and finish at one micrometre. Generally, polishing with diamond suspension gives finer results than using silicon carbide papers (SiC papers), especially with revealing porosity, which silicon carbide paper sometimes “smear” over. After grinding the specimen, polishing is performed. Typically, a specimen is polished with a slurry of alumina, silica, or diamond on a napless cloth to produce a scratch-free mirror finish, free from smear, drag, or pull-outs and with minimal deformation remaining from the preparation process. 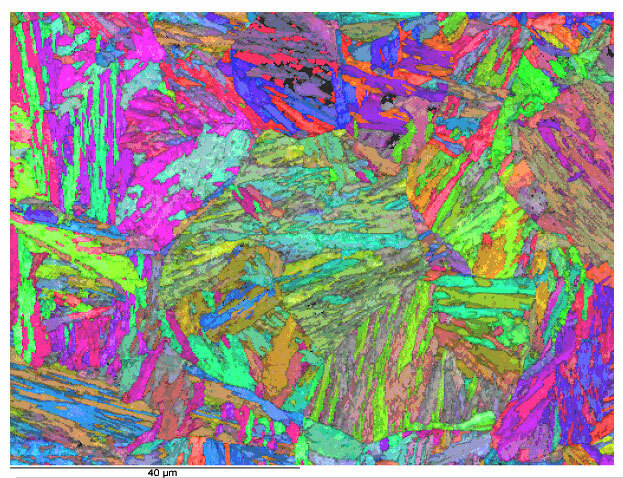 After polishing, certain microstructural constituents can be seen with the microscope, e.g., inclusions and nitrides. 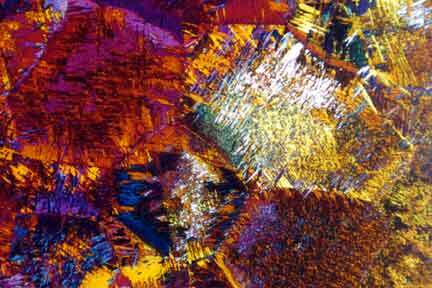 If the crystal structure is non-cubic (e.g., a metal with a hexagonal-closed packed crystal structure, such as Ti or Zr) the microstructure can be revealed without etching using crossed polarized light (light microscopy). Otherwise, the microstructural constituents of the specimen are revealed by using a suitable chemical or electrolytic etchant. A great many etchants have been developed to reveal the structure of metals and alloys, ceramics, carbides, nitrides, and so forth. 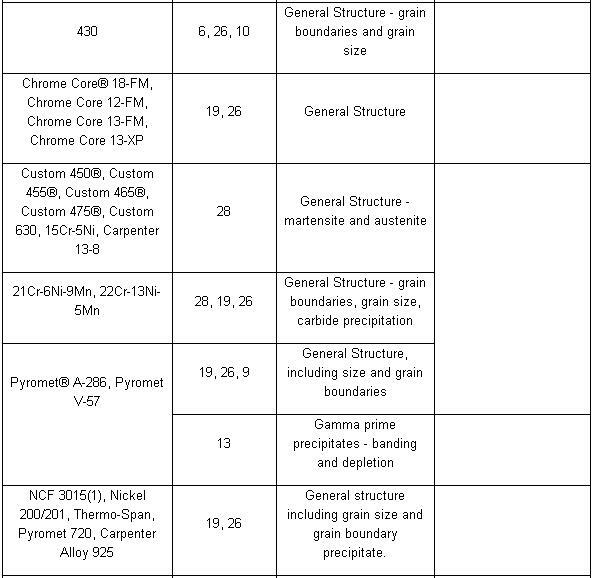 While a number of etchants may work for a given metal or alloy, they generally produce different results, in that some etchants may reveal the general structure, while others may be selective to certain phases or constituents. 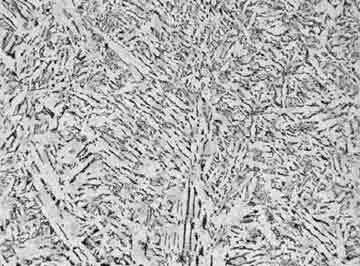 Prepared specimens should be examined after etching with the unaided eye to detect any visible areas that respond differently to the etchant as a guide to where the microscopical examination should be employed. Light optical microscopy (LOM) examination should always be performed prior to any electron metallographic (EM) technique, as these are more time-consuming to perform and the instruments are much more expensive. 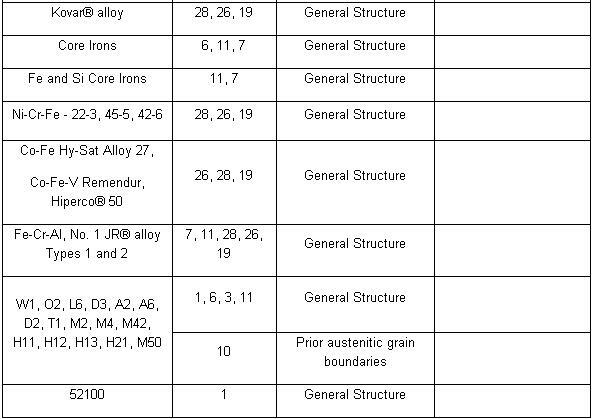 Etchant for each alloy is different (look at the table). Principle of etchant is to “eat” the some of grain boundary and matrix on the specimen. For example, to etch Aluminum Alloys is different with to etch the Stainless Steel. 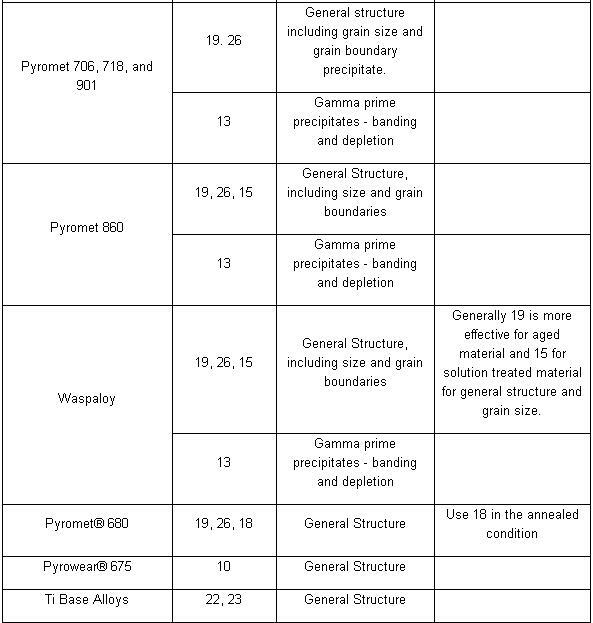 For the example nickel-base and cobalt-base alloys, with their superior corrosion resistance, are etched using Waterless Kalling’s, Glyceregia, Acetic Glyceregia and Ralph’s. 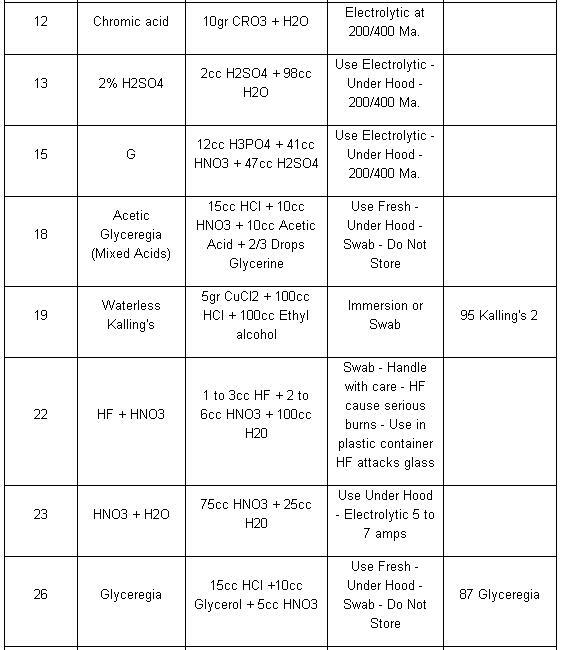 If the etchants typically used for highly resistant stainless and high temperature alloys do not work, HCL + H2O2 can be used. These alloys usually should be etched slowly. 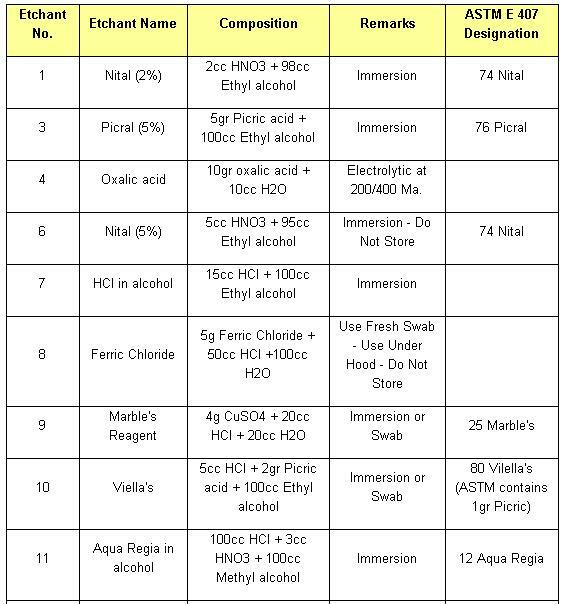 Note: Please see ASTM for proper handling of all chemicals. NOTE: Etchants listed in order of preference. All Etchants should be used on a freshly polished surface. In order of increasing strength, those etchants are: Nital, Villelas, Ralph’s, Glyceregia, Acetic Glyceregia, Waterless Kalling’s, and Hydrochloric Acid + Hydrogen Peroxide. The challenge with these alloys is to offset their natural tendency to self-passivate rapidly in the presence of oxygen. To effectively process these grades, etching must be done immediately after final polishing. Rinsing, drying and etching should be performed without delay. When etching these highly resistant alloys, the etchant should be prepared in advance of the polishing process. This advance planning will minimize the length of time between polishing and etching, thus permitting a more effective microstructural evaluation. Samples should be polished and etched individually rather than processed in batches. Further, certain features can be best observed with the LOM, e.g., the natural color of a constituent can be seen with the LOM but not with EM systems. 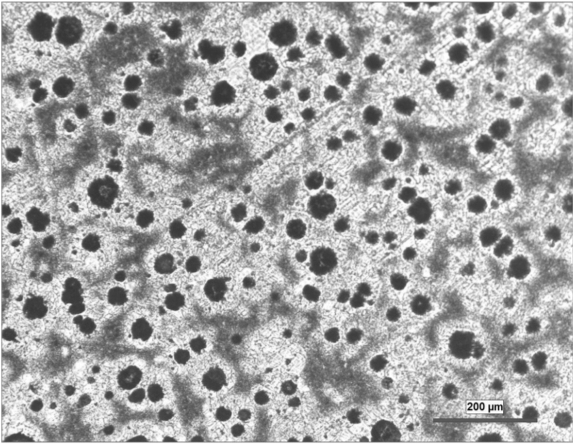 Also, image contrast of microstructures at relatively low magnifications, e.g., <500X, is far better with the LOM than with the scanning electron microscope (SEM), while transmission electron microscopes (TEM) generally cannot be utilized at magnifications below about 2000 to 3000X. LOM examination is fast and can cover a large area. 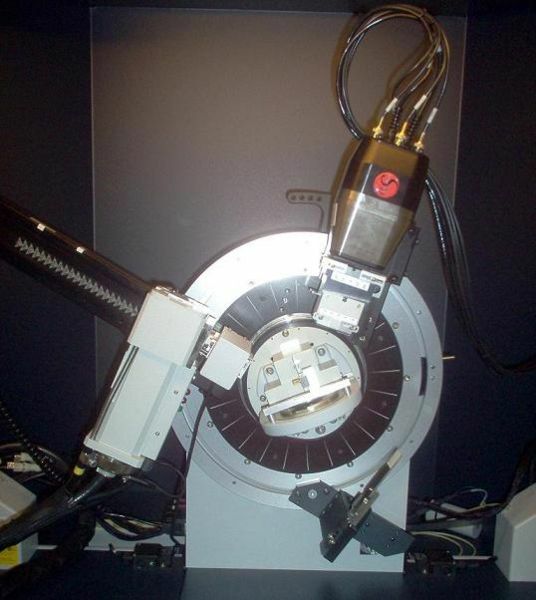 Thus, the analysis can determine if the more expensive, more time-consuming examination techniques using the SEM or the TEM are required and where on the specimen the work should be concentrated. If a specimen must be observed at higher magnification, it can be examined with a scanning electron microscope (SEM), or a transmission electron microscope (TEM). When equipped with an energy dispersive spectrometer (EDS), the chemical composition of the microstructural features can be determined. The ability to detect low-atomic number elements, such as carbon, oxygen, and nitrogen, depends upon the nature of the detector used. The WDS system has historically had better sensitivity (ability to detect low amounts of an element) and ability to detect low-atomic weight elements, as well as better quantification of compositions, compared to EDS, but it was slower to use. Historically, EDS was used with the SEM while WDS was used with the electron microprobe analyzer (EMPA). Today, EDS and WDS is used with both the SEM and the EMPA. 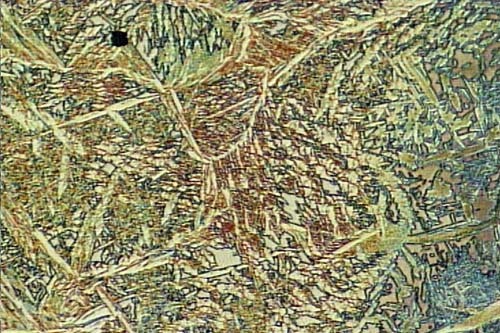 Characterization of microstructures has also been performed using x-ray diffraction (XRD) techniques for many years. 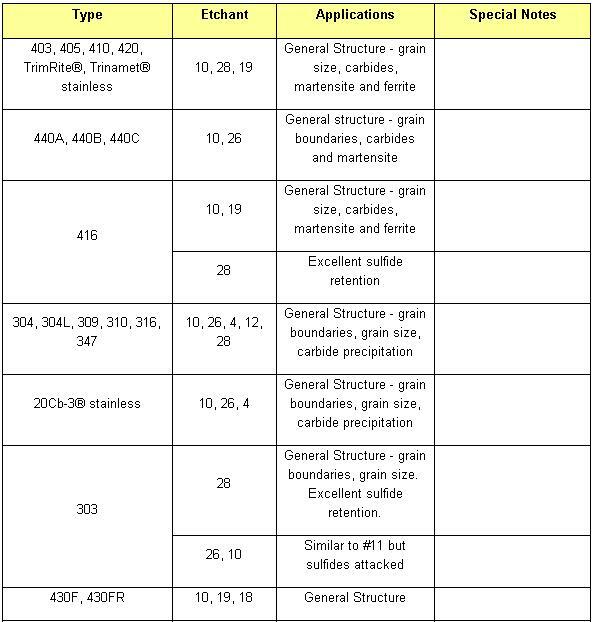 If a particular phase can be chemically extracted from a bulk specimen, it can be identified using XRD based on the crystal structure and lattice dimensions. This work can be complemented by EDS and/or WDS analysis where the chemical composition is quantified. For smaller particles, diffraction techniques can be performed using the TEM for identification and EDS can be performed on small particles if they are extracted from the matrix using replication methods to avoid detection of the matrix along with the precipitate.